Jon Amos -Team Leader , I.T. and Communications. Job : To hand cycle from Darwin to Adelaide, to succeed where others have failed and to set a new world record. During the expedition carry out comparative tests on himself and another team member to see how the extreme conditions may affect them. To promote the aims and objectives of the Wheelchair Sports Worldwide Foundation. Biography : Although left paraplegic after a road traffic accident in 1976, the grass has never grown under his feet. He has always taken an active role in the field of sport. He has lifted for Great Britain,become the coach for the British Weightlifting Association for the Disabled and received the Coach of the Year Award in 1997. In 1998 he attempted to reach the summit of Mount Kilimanjaro but was defeated by the weather.Jon is married to Lynn and they have two children,Rebecca and Robert. Ambition : Amongst the many, the most important one is to live and enjoy life to the full. Cpl. Simon Davies Assistant Team Leader. Job : To act as an out-rider to Jon and be utilised in the comparative tests. He will also act as the PR link to Jon and the team. Biography : Simon has been in the Royal Marines for 12 years, at present he is an instructor in the Landing Craft branch. He has travelled extensively around the globe and has spent the majority of his career in operational units.As a Royal Marine Commando you must have the ability to adapt and Simon has had plenty of practise, as he has worked in many different environments and conditions from the Arctic wastes of Norway to the extreme heat of Central America. He was privileged to be on the team of Jon's 'Challenge of Endeavour' last year climbing Mt. Kilimanjaro. However he admits the 2020 mile World Endurance record Jon will be attempting in July will be his toughest challenge yet. When Simon is not working he enjoys climbing and mountain biking with his girlfriend Pamela. Cpl. Stuart Gentry. I.T. and Communications. Biography : Stuart has served in the Royal Marines for 12 years. He has travelled extensively from the northern flanks of Norway through the jungles of Brunei and Belize to the deserts of North Africa. Cpl. Gentry found himself drawn to a life on the water, having grown up in and around the Yorkshire fishing town of Whitby, and specialised in the Landing Craft branch of the Royal Marines. Although leading a hectic lifestyle, Stuart enjoys most sports, especially mountain biking and water sports. Stuart says he feels privileged to have been selected for the 'Challenge' . Stuart is married to Charlotte and currently resides in London. Ambition : To sail around the world. Cpl. Ian Lawton P.T.I. and Remedial Therapist. Job : To collate data for the comparative tests, to ensure that Jon stays in the best possible condition throughout the 'Challenge' and to drive one of the support vehicles. 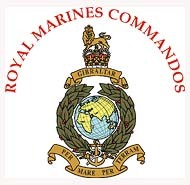 Biography : Ian is a serving member of the Royal Marines based at RM. Condor in Scotland. He is a physical training instructor, specialising in Remedial Therapy. He has enjoyed travelling the world, mainly in an official capacity, Hong Kong, Malaysia, Bahrain, Turkey, Cyprus and Iraq to name but a few. Ian has an avid interest in sports , he holds a National medal in Dragon boating but football is his main interest is football. Ian normally resides in Somerset with his wife Sandra and their three children Simon, Lee and Aaron. Ambition : short term to assist Jon in completing his world record attempt, long term to work in a position of remedial therapist for one of England's premiership football clubs. Job : To maintain the bikes of the out-riders and the hand cycle, to ensure that the team gets a balanced diet and to drive the other support vehicle. Biography : Martin joined the Royal Marines in 1987 after having served an apprenticeship as a bike mechanic at Plymouth Cycles .After completing his recruitment training with the Royal Marines he served at 42 Cdo. as a rifleman and Mortar troop, he served on HMS Ark Royal during the Gulf War. He has also served with Cdo's 40 and 45. In 1997 he completed his chef training and joined RM.. Poole. Martin is interested in a variety of sports which include running, triathlon, biathlon, cross country skiing, Outdoor pursuits and Extreme sports. He has raised money for charity through running events. He has also boxed for the RM... at both Bantam and Feather weight classes, he has represented the Combined services at Cross Country and from 1993 -97 was part of the Biathlon team.